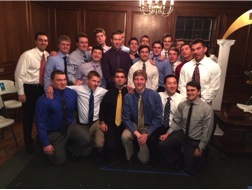 On February 10, 2014 Gamma Zeta active members and alumni gathered to initiate our newest class, most who will graduate in 2017. ATO National CIO Wynn Smiley was there to show support along with alumni Jim Dobrovolny ’70, Greg Scott ’76, Jack Klues, Dane Luhrsen, Don Armstrong and Dave Seiler, all 77’s, Dave Krug ’95 and Jeff Eversden ’05. This is a talented group of guys who came in with a GPA for this past fall of 3.19, which was above the Chapter, Fraternity and All Men’s averages. Welcome guys!!! Keep up the great work. This entry was posted in Announcements, ATO Undergrad News by Alpha Tau Omega - Gamma Zeta Chapter. Bookmark the permalink.